To use a cart, you will need a quarter. 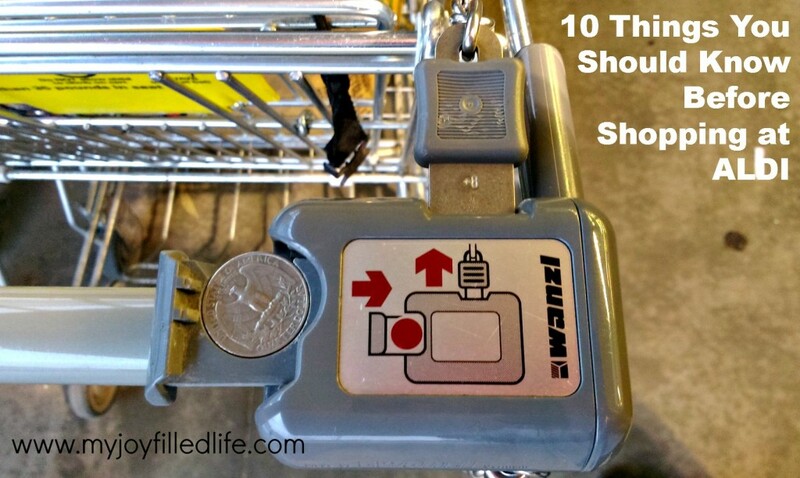 They have these little thingies (I really don’t know what else to call them) on the handle of the cart that you put a quarter in that unhooks the cart from the cart in front of it. When you are done shopping, take the cart back to the cart corral and connect the cart back to the others and get your quarter back. If you forget a quarter, you can go in and get one at the register, but having one ready to go is a time-saver. I keep a quarter in each of our cars that is my ‘ALDI Quarter’ that no one is allowed to spend. 2. They don’t take credit cards. Aldi now takes credit cards! Woo hoo!!! The only forms of payment that ALDI takes is cold, hard cash, debit cards and EBT cards. They also don’t take checks or WIC. 3. They don’t take coupons. That’s pretty self explanatory. They don’t take manufacturer’s coupons and they don’t distribute store coupons of their own. So, no coupons needed. 4. Take your own bags. 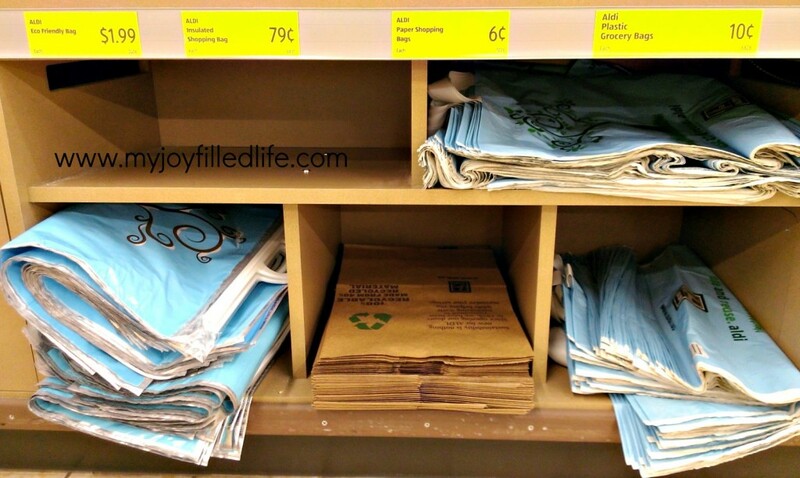 Take your reusable shopping bags, your grocery bags from a previous shopping trip, or you can buy bags at the checkout. They have brown paper bags, plastic grocery bags, reusable shopping bags, and insulated bags for purchase. You are also welcome to use any of the empty boxes you come across in the store to pack your grocery up. 5. Be prepared to bag your own groceries. At ALDI, the clerk will scan your groceries (at an impressively rapid rate) and just put them back in a cart. They don’t bag the groceries for you; you will do that after you pay. They provide a bagging area with lots of counter space to organize and bag your haul. 6. They guarantee their products. They have a great guarantee policy, it’s called Double Guarantee. If you aren’t 100% satisfied, they will refund your money and replace the product. 7. They do carry major brands. I’ve been seeing more and more major name brands showing up on the shelves at ALDI – Pampers, Coke, Hawaiian Punch, Gatorade, Pringles, Oscar Mayer, to name a few – I’m sure selections will vary by store and by season, although some of the name brand products seem to be turning into a permanent offering at my local ALDI. 8. Their store hours aren’t your typical grocery store hours. ALDI is not open at the crack of dawn, it is not open late at night, and it is definitely not an ‘open 24-hours’ store. So, if it’s late in the evening and you realize you just drank the last of the milk (and the kids require chocolate milk first thing in the morning), don’t head to ALDI to get some – you’ll only find a deserted parking lot and a dimly lit store. Your store hours will vary, so check them out before you shop. My local ALDI is open Monday – Friday from 9am to 8pm; Saturday & Sunday from 9am to 7pm. 9. They sell more than just food. They carry toys, household items, outdoor items, and much more. These things are very seasonal and I have seen anything from bunk beds to chainsaws to commodes (yes, portable toilets). I actually look forward to see what goodies I might find each time I shop. 10. Their food is good. I’m always hesitant to buy generic brands, however ALDI isn’t a generic brand, it’s a private label and their products have even won several awards. Through testing and manufacturing by many of the nation’s leading food producers, and working closely with suppliers, ALDI ensures that their brand meets or exceeds the quality of name brand products. The also carry a Fit & Active line and a natural foods line, Simply Nature. 11. You really do save money! 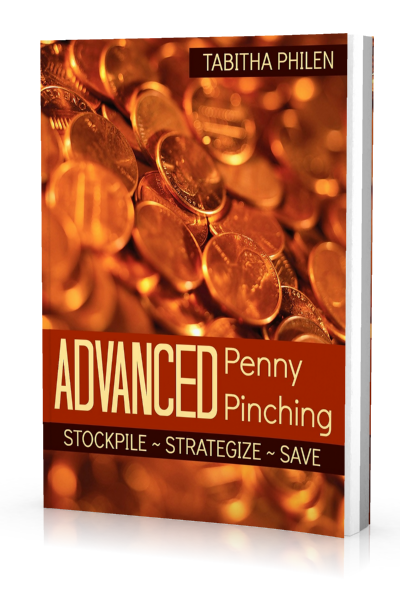 If you are looking for more ways to save money when it comes to buying grocery, I recommend checking out Tabitha Philen’s book, Advanced Penny Pinching. I started using coupons, matching them up with sales, and stockpiling about 10 years ago. While I don’t shop to save to the extreme that I used to, I still appreciate getting a good deal, finding good sales, and saving on groceries. I’m so glad that somebody (Tabitha) decided to write all of this down (and much more) and share it with other homemakers. Advanced Penny Pinching features over 70 pages of tips and tricks for maximizing your grocery budget by offering step-by-step instructions on how to build a stockpile; tips on preparing for your grocery trips with price lists, coupons, and menu planning; help with changing your shopping habits; insight into shopping at wholesale clubs; and so much more. What are some of your money-saving strategies for saving on groceries? I have shopped at Aldis for many years…. and save money there also. I really like most of their products…. and have tolerated a few of them. I do check prices and sometimes the sales at a “regular” grocery store are cheaper…. if you see a special on plants at Aldi – don’t plan to think about it and maybe buy it the next week – better buy it now, or they will be gone, at least in my area. That’s how a lot of the seasonal items seem to be – there one week and gone the next. Thanks for the tips! 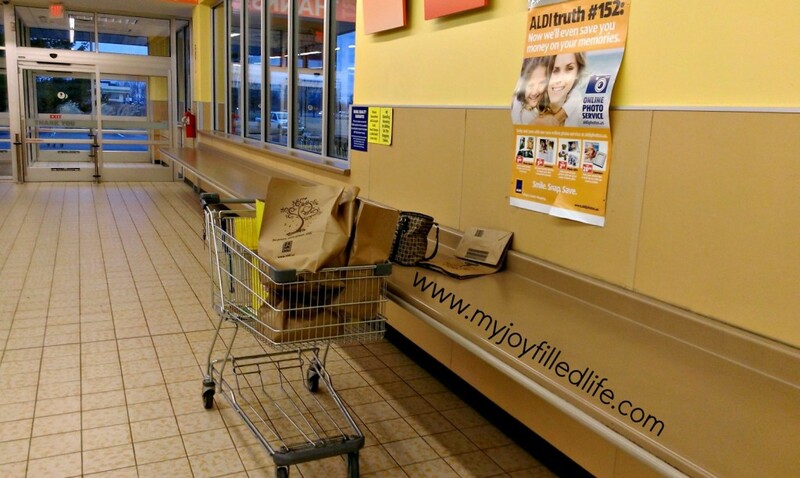 We haven’t been to Aldi but i had heard about the cart + bags being “not free” (so to speak). Great list, it was hard to read though. The VERY annoying flares ticker (?) was in the way the whole time and can’t be moved, or taken off. Reminds me off popups. Sorry about that Danielle; I think it depends on what kind of device you are reading on. I think there might be an option to allow people to close it; I’ll have to look into it. Awwww… Yes, I am on a tablet. I did look for an “x”, or close. But didn’t find one. Of course they tend to be tiny (in general, I’ve had the issue with ads on other pages) so you end up clicking on what you don’t want to. haha–I’ve been shopping at Aldi so long that I kind of forgot about how weird some of their quirks are–you definitely get used to it! And you do save money! Just the other day I bought a 5 lb. bag of red potatoes, and then later in the day I was at another grocery store to pick up some things Aldi doesn’t carry, and out of curiosity I checked the price for a 5 lb. bag of red potatoes–it was $1.50 more than the Aldi price and that made me very happy! 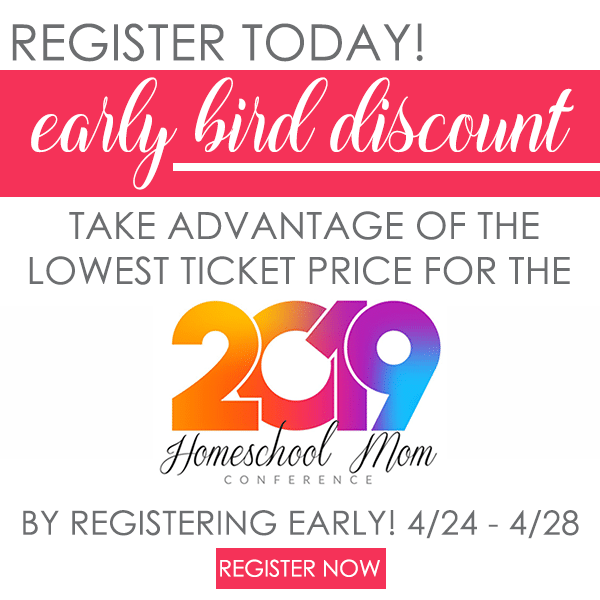 Hopping over from A Mama’s Story link up! LOL @ the commode! I’ve never seen that, but it doesn’t surprise me. The first time I brought my husband to Aldi, shortly after we got married, he was shocked at how little we spent. I stopped shopping there for a while because at that time much of their stuff had additives we try to avoid, but I’ve been pleasantly surprised to see more and more organic and all natural items as time goes on. I’ve fallen in love with Aldi all over again! They sure do scan fast at Aldi. Its real fun trying to load up the pram basket as they scan away. I don’t do huge shops there but when I totally run out of fresh produce I load up and they do a fantastic family meat pie that i always seem to buy when we go there. Still not sure on a lot of the cleaning products though! I’ve always thought that your Aldi’s stores were typical to our Winco stores, but ours doesn’t sell toilets, beds or chain saws, lol! They also provide plastic bags and don’t do the quarter thing. But the prices are excellent and we DO have to pack our own groceries. I have wanted to try an Aldi’s because I’ve heard people talk about it so much, but there’s none in WA. Thanks for linking up to Making Your Home Sing Monday! I agree, Aldi does save you money. I’m not sure how much the same Aldi is here in Australia, but what have found is that there are some items they don’t stock and I find myself having to go to the other supermarket chains to buy them which can get annoying…for example, Aldi nappies give my son a rash, Aldi doesn’t sell toddler toothbrushes or toothpaste and so on…so often I’ve just reverted back to my old grocery store but I know I must try Aldi again considering what the Australian government will be doing soon and increasing costs again! Aldi came to our town a little over year ago. It has become my favorite store to buy groceries. Everyone has been super friendly, their food is good, and I save at least $40 each week off what than I would pay at the regular store. I have three teens so I need to save where I can. I especially love that their milk is a dollar cheaper a gallon, because my son drinks a lot of milk. 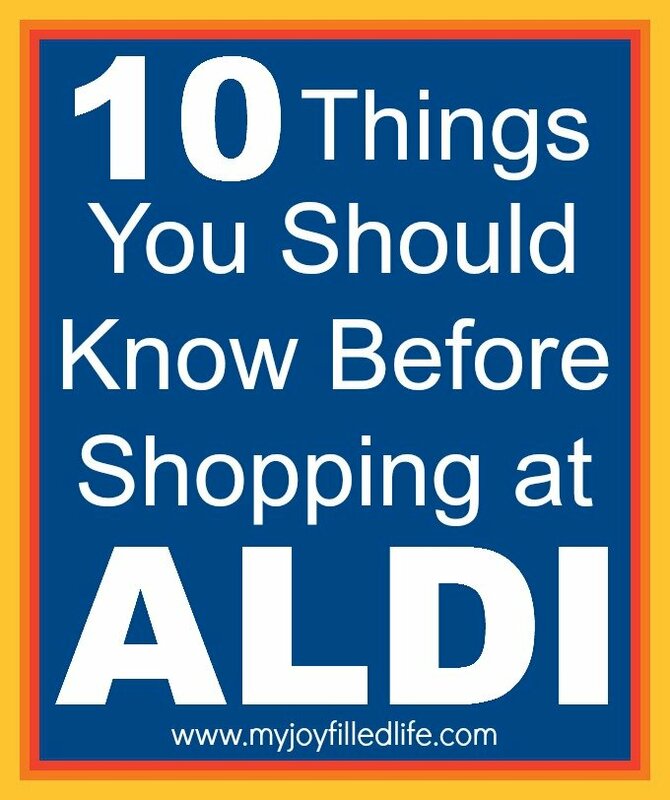 Great tips for shopping at Aldi. I would love to check this store out! I didn’t even know you have Aldi in the US, they’ve been here in the UK for at least 25 years and I’ve been shopping there (with occasional trips to other supermarkets) ever since. I love their prices and have just got used to the way they fling you through the checkout! Only once have I had something that was just too cheap, they do a super cheap cornflakes that are really horrible! Everything else is great quality and really good value. I completely agree with what you say about the stuff coming and then going, grab it when you see it because next time you go it will all be gone! Great post. I just discovered Aldi this year. I wish I knew about the quarter before my first trip 🙂 You do save a lot of $ there, especially on produce. ALDI is my favorite store! They have wonderful cheeses and great deals on kitchen gadgets! I know I save alot on the essentials and pantry items. Great encouragement to get other people to ALDI. I LOVE ALDI!!!! I was apprehensive at first to try them too but I’m so happy that I started shopping there. I’ve been able to save so much money for our family. We shop at Aldi’s every week – sometimes we have to supplement with Wal-Mart because Aldi’s doesn’t carry everything. Their take and bake pizzas are excellent!!! We’ve only found a couple of things of their brand that we don’t like. Good food, great prices, and you can get in and get out in a hurry! We’re in New England. The produce at our Aldi store is not very good. A lot of it is just on the verge of spoiling, so I would recommend caution. We only get the melons and bananas there. Also, I keep a price log on our regular wares, and Aldi has been gradually raising prices while shrinking packaging sizes. Folks concerned about health should note that many of the Aldi brand products do have excess sodium in them. The pretzels were so salty I found them to be inesible, for example. For more than the basics on how the store operates, I would recommend searching on Reddit. Folks there post comments about whether the store really is the frugal choice in their area, etc. We have a short list of items we will get there, but everything else we get from other places because they are cheaper and/or healthier. P.s. This pop up flares box is really bad. There is no way to get rid of it. This is my first time at this blog (I followed a link) but I can’t stay to look at other posts because of this box. You definitely want to look into removing it or something. I shopped at Aldi’s for the first time today. I’m in Florida . The store layout is a complete mystery to me. I did find the produce looked very good and the prices were excellent. I will say that if you are watching your sodium and/or fat intake, I couldn’t find much in the way of reduced sodium or fat-free or low fat versions of foods I was looking for. Selection is limited in almost all categories. I don’t by chips, cookies and junk food and there seems to be no shortage of those items. I will definitely go to Aldi’s for produce. I´m from Germany, the motherland of ALDI. It´s alway interesting, how others see ALDI. What is special to you, is since over 40 years normal to me. The ALbrecht-brothers were very mean. The ALbrecht-DIscounts are legendary. The quarter makes sure that the cart get back in it´s garage. A lonley cart could hint a car and causes expensives. Saving these costs gets directly to your grocery-bill. Also the costs for somebody, packs your bags or take back your cart or the extra-costs for night-opening. 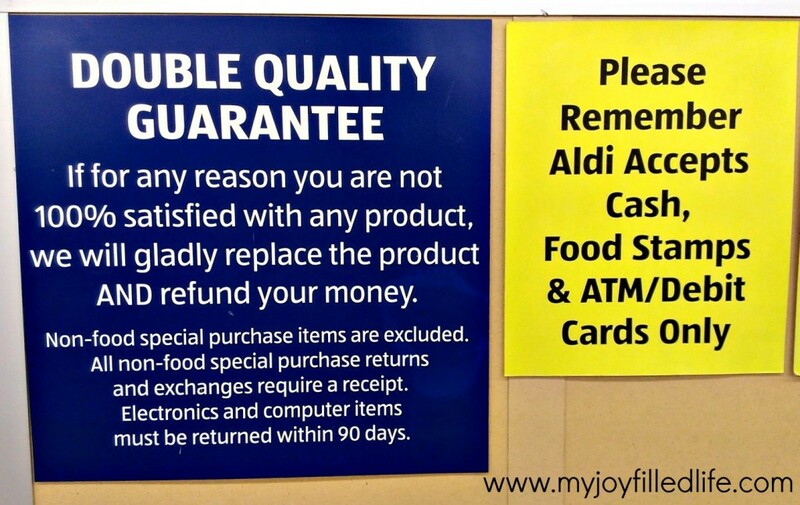 Credit-cards fees for the store , bags and coupons in announcements are also extra costs, ALDI saves for you. In Germany, Aldi is the reference market leader, making the prices for the basic food. He is ALWAYS the cheapest with the best quality. You haven´t to be afraid to shop to ALDI, enjoy it! I like Aldi also. I was concerned at first because their original base is from Germany, their fruit and vegetables are from local farmers. my first trip to Aldis I was almost arrested. I foolishly attempted to “help” by walking up to an elderly lady and offering to return her cart to the store. I didn’t know about the quarter and I was flabbergasted at her venomous reply that I sure wasn’t going to “steal her money”. I had no idea you paid a quarter for the cart. LOL. Now I will offer to trade quarters if I want to help. Was your card a debit card? They do accept those. German foods/Oct. Fest; Easter, Christmas, etc. Fun to find the varieties that fit the season. I have also purchased at special prices things for the home. I think they rush you. What’s the big rush at the check out. Feel like I’m being thrown out. Don’t like it.